What comes to mind when you think of France? Do you fantasize about wine, eclairs, and outdoor cafes? Cathedrals, towers, and great works of art? How about liver and storks? But on a recent visit to Strasbourg, I found that while travelers may not have their minds on liver and storks, the French do. Despite the fact that their city was founded during Roman times, was endlessly fought over by Germany and France, and has become a symbol of prosperity by hosting the European Parliament…despite all this, the locals seem fascinated with liver and storks. 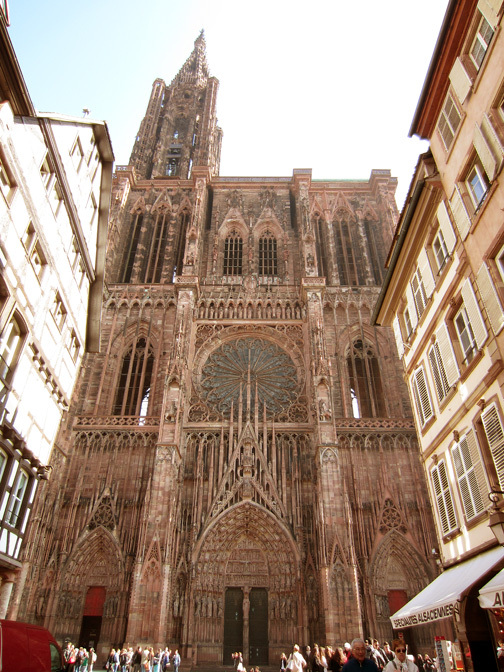 You might not notice it at first, since you will undoubtedly be awed by the great cathedral at the center of town, a building that for centuries was the highest in all of Europe. 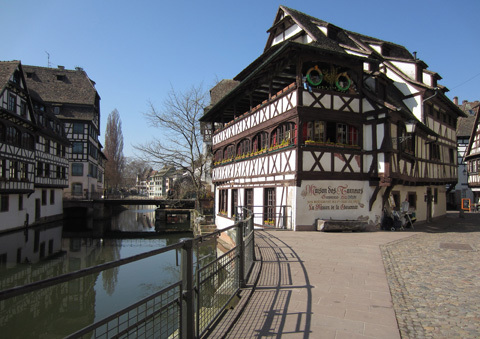 You will be swept onto the canals of Strasbourg and taken by boat through La Petite France (which, despite its modern romantic charm, is named for the hospital where soldiers were treated for venereal diseases contracted during the Italian wars). 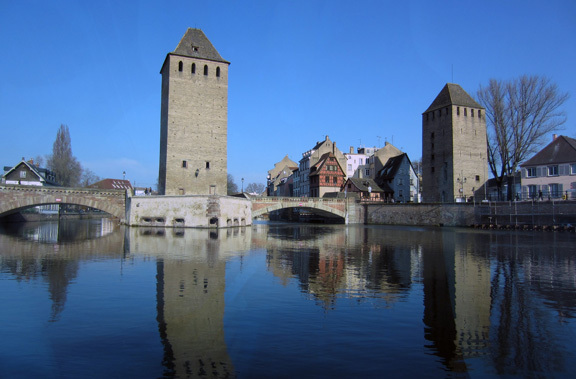 Then you will float by fourteenth century towers that protected the “Fortress on the Road” in medieval times. 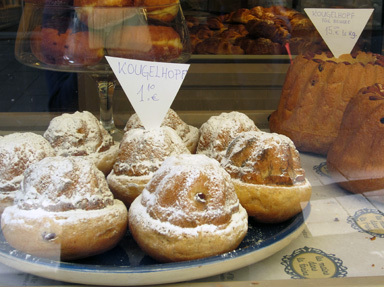 But after you return from your boat tour, fill your belly with a traditional kougelhopf, and then take a closer look. What are those things lining the streets that so elegantly frame the cathedral? Stuffed storks. And what’s being served in restaurants and sold in fine food shops? Liver. Why? Well, it seems that in the Alsatian region of France, where Strasbourg is located, storks have been longtime residents and are considered a symbol of happiness. The bird has spawned a tradition that you may not want to tell your kids: when a child wants a little brother or sister, she can set a piece of sugar on the window ledge to bribe the stork, who we all know to be the bringer of babies. It would seem that geese have not been as fortunate as their cousins. In Alsace, goose liver pate (foie gras) is a delicacy on the level of caviar. In the old days, geese used to be cruelly pinned down and force-fed in order to fatten up their livers. Now the EU has ensured that they are treated in a more humane way, but the dish continues to be highly sought after. 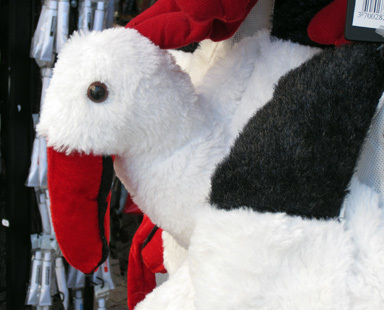 I don’t know about you, but I can’t think of anyone on my gift list who wouldn’t be thrilled if the souvenir I brought home from France was a tin of liver and a stuffed stork. Excuse me…I have some shopping to do. Yes! And it’s often so unexpected.